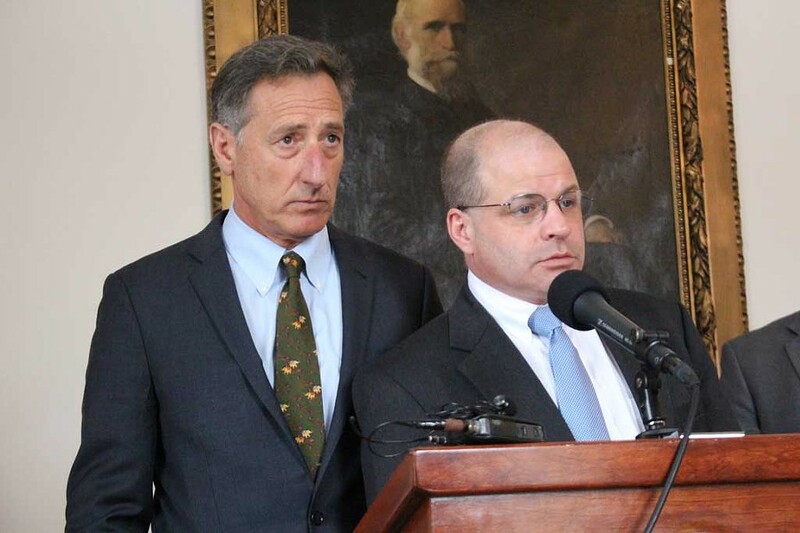 Date Certain: Shumlin Sets a Health Connect Deadline, But Why? Four weeks after Vermont Health Connect sputtered to a start in October 2013, Gov. Peter Shumlin summoned reporters to his Montpelier office to "apologize for the challenges that we've been facing. "I take full responsibility for them," he said. "I will continue to fix them." Asked precisely when the online insurance marketplace would function as advertised, the gov debuted a line that would become a sort of mantra over the next year and a half. "If I've learned one lesson as governor, with my enthusiasm to make change and get tough things done, it is this," Shumlin said. "Never give a date again." It was a clever, if cynical, tactic: "Because I couldn't meet one deadline," he seemed to be saying, "I won't ever subject myself to another." For the next 17 months, Shumlin largely kept his promise to eschew further Vermont Health Connect promises — until last Friday. In an interview with WDEV's Mark Johnson that morning, conducted on a couch outside the Statehouse cafeteria, Shumlin announced two new, self-imposed deadlines — and one big consequence if he fails to meet them. The deadlines: By the end of May, state contractor Optum must finally fix the automated process through which Vermont Health Connect users update account information, such as changes in employment or family status. By October, Optum must be ready to smoothly enroll and reenroll users for the 2016 plan year. "What happens, governor, if all your expectations that it works don't get delivered?" Shumlin asked himself later that morning at an impromptu press conference in his ceremonial Statehouse office. "What's your plan?" To jettison Vermont Health Connect, he answered himself, and replace it with the federal healthcare.gov site — or, more likely, with a hybrid exchange using the feds' technology but retaining some state control. "We think that we're going to deliver finally on an exchange that's going to work for Vermont," Shumlin said. "If not, we want Vermonters to know what the contingency plan would be." The governor's surprise announcement raised more questions than it answered. As soon as Shumlin unveiled the plan, he and his chief of health care reform, Lawrence Miller, proceeded to trash it. "This is not an attractive option," Miller said at Friday's press conference. In a subsequent interview, he argued that ditching Vermont Health Connect for any kind of federal system was "a bad choice" and "a very bad outcome." Driving home the point, Miller said of his own plan, "We should not do this." It wouldn't be cheaper. It wouldn't be simpler for many families to navigate. It wouldn't be easy to provide state subsidies to lower-income Vermonters. It might jeopardize federal subsidies, depending on the outcome of a U.S. Supreme Court ruling expected this summer. It wouldn't even mean the end of Vermont Health Connect, since Medicaid recipients would still have to use the platform. And it wouldn't happen until late 2016. So, um, why even contemplate it? "The general assumption was we're insane to keep doing what we're doing and expect a different result," Miller says. "We just really wanted to say, 'No, we're not insane. We really do have confidence things are different.' If they're not, if our judgment is wrong, we'll head in a different direction — and these are the conditions under which we will do that." But why, after avoiding public deadlines for so long, commit to two new ones? Why not let the legislative session dominate news coverage and quietly work to solve the problem? You know, let sleeping dogs lie? "I do wonder, 'Why now?'" says Lt. Gov. Phil Scott, who has long advocated for ditching Vermont Health Connect. "And I don't have the answer." In the absence of a clear political motive, plenty of theories have emerged. The most obvious is that Optum, which replaced failed contractor CGI last summer, is actually very close to solving the so-called change-of-circumstances problem — and Shumlin's setting himself up for a "mission accomplished" victory lap in May. Or perhaps it's just the opposite. The administration has reason to believe the fix will never be made and is providing itself an exit strategy and a scapegoat: Optum. Another possibility is that the legislature forced Shumlin's hand. With a House floor fight expected this week over next year's budget, a savvy opponent could have proposed an amendment to replace Vermont Health Connect — and even the most loyal Democrats might've had a hard time voting no. A more charitable version of this theory is that the administration wanted to provide legislators a more coherent message to pass along to irate constituents. "I think the administration ultimately makes the decisions it makes," says House Speaker Shap Smith (D-Morristown). "But we did talk to them about the need for a contingency plan, and I think they were responding to the concerns many of us had expressed." Rep. Bill Lippert (D-Hinesburg), who chairs the House Committee on Health Care, says he was surprised by the timing of Friday's announcement. "But the speaker made it very clear some time ago that he was asking us and others to look at what alternatives there might be." One final theory is that Shumlin is inoculating himself against the release of a long-awaited audit being conducted by state Auditor Doug Hoffer, who provided a draft to the administration last week. Hoffer won't disclose what he found until its formal release next month, but he says it focused on whether the administration followed recommendations provided by its own consultants. "The question is: Did the state, in response to those reports, commit the resources in the right place, at the right time, in the right sequence?" Hoffer says. Miller shakes off all those explanations. "I think the theories that are out there are interesting," he says. But, he maintains, the truth is far less so: Now that this year's open enrollment period is in the rearview mirror, he says, the administration is focusing on Vermont Health Connect's remaining problems — and considering contingencies. "There's only so much capacity," he says. This was the year legislative liberals were hoping to provide universal health care, legalize marijuana and guarantee paid sick leave for all workers. Instead, the Democratic majority in the Vermont House is preparing to cut the budget by $53 million, targeting everything from low-income heating assistance to adult day care to early childhood education. House Democrats are planning to cut hundreds of state jobs, ban teacher strikes and cap school district budgets — an idea they panned back when former Republican governor Jim Douglas proposed it. "There are some very significant cuts to many Vermonters who are vulnerable," Rep. Joey Donovan (D-Burlington), the caucus' cochair, said last Friday as she and her colleagues discussed the budget proposal in a vacant committee room. "Across the board, they're pretty awful." The caucus formally registered its dissatisfaction last Thursday in a letter to Speaker Smith, saying they were "unable to support a budget that includes drastic cuts, reductions in work force, and new revenue of only $35 million." Twenty-three members signed it. Rep. Jean O'Sullivan (D-Burlington) was one of them. She says she plans to vote against the budget when it reaches the House floor this Thursday. "The overarching issue is we are closing a budget gap on the backs of working Vermonters," she says. Though all four Republicans on the House Appropriations Committee voted in favor of the budget Monday, House Minority Leader Don Turner (R-Milton) says the vast majority of the chamber's 53 Republicans will oppose it on the floor. If some of the House's six independents join them and the 23 liberals who signed the letter stand firm, Smith may struggle to find the 76 votes he needs to pass the bill in the 150-member body. But as O'Sullivan herself noted, several caucus members — particularly freshmen and members of Smith's leadership team — did not feel comfortable signing the letter. "When you're making a statement that's as strong as this, you have to really know the consequences," she says. Translation: If you cross the speaker on a vote like this, pack your bags for legislative Siberia. Otherwise known as the House Fish and Wildlife Committee. But according to Rep. Chris Pearson (P-Burlington), there are also consequences if you don't stand up for something every now and then. "If we held firm and the budget got stalled, they would bring a bunch of us into the speaker's office, yell at us for a couple minutes and then say, 'What can we do to get you guys to vote for the budget?'" he says. "It's pretty elementary to me. It's legislating 101." But — truth bomb — few House Democrats have the stones to stand up to the speaker. As they did last year when they blew their chance to raise the minimum wage at a faster rate than Smith and Shumlin preferred, many House liberals will back down this week and toe the party line. And Smith knows it, which is why he doesn't bother bargaining with them. "I think the budget and tax bills will pass," he said with confidence Monday afternoon. "The budget just passed out of Appropriations on an 11 to zero vote, and think that's going to send a signal about a budget that's worthy of support." Pearson argues that the legislature should be focused on fighting income inequality, and he believes Vermont has the tax capacity to do so. Indeed, a report released Tuesday by the Montpelier-based Public Assets Institute, a left-leaning think tank, shows that Vermont's effective income tax rate is lower than all but 12 other states. "There is widespread acknowledgement that this problem exists and there is absolutely no focus on any policy changes that might address it," Pearson says of the state's inequality. "If that's the case, what the hell is the point of electing majority Democrats?" To that, Smith says his party is doing plenty to protect health insurance subsidies, funding for higher education and drug abuse treatment. And, he cautions, the fight isn't over until the House and Senate sign off on a final budget in May and send it to the governor. "It's an iterative process," the speaker says. "Judge us by what we end up with — not where we are right at this moment." During next week's Senate recess, Sen. Bernie Sanders (I-Vt.) will embark on a six-day tour of four states that are not Vermont. Sanders, who is considering a run for president next year, is scheduled to touch down in Los Angeles, Hollywood, San Francisco, Las Vegas, Austin and Chicago. Nevada, of course, is the home to the second caucus in the Democratic presidential primary race. Sanders is scheduled to hold town meetings with unions representing musicians, culinary workers and electrical workers — and attend a leftie conference in LA called Sister Giant, hosted by self-help guru Marianne Williamson. In Chicago, he'll appear at a steel workers' union hall alongside Chicago mayoral candidate Jesús García. Better known by his nickname, "Chuy," the Cook County commissioner is locked in a runoff with Mayor Rahm Emanuel, the former White House chief of staff who served with Sanders in the House. So has Bernie endorsed García, as former Vermont governor Howard Dean did earlier this month? "I don't think so," Sanders spokesman Michael Briggs says tentatively. "I'm still waiting to hear him talk about it some more, actually." The original print version of this article was headlined "Date Certain"